It is 30 years since the first woman was appointed a bishop in the Anglican Communion. How have they fared since? The Anglican Communion is the third-largest grouping of Christians in the world with about 85 million members. It is made up of 40 autonomous provinces, twelve of which have consecrated women as bishops. Several others have made provision for women to become bishops but have yet to elect or appoint any.The question of whether it is permissible for women to enter holy orders as deacons, priests and bishops has been fiercely contested within the Anglican Communion’s recent history. Deacons are the initial order of clergy, able to officiate at marriages and funerals but not to preside at Holy Communion. In churches that ordain women as priests the diaconate (office of deacon) is usually a stepping stone to priesthood. The role of a bishop is to be a “shepherd,” an authoritative teacher with pastoral oversight over a diocese.Most Anglican provinces choose their bishops by election. Because the Church of England is established in law, bishops are appointed by the Crown after consultation within the Church.The first woman to become a bishop in the Anglican Communion was Barbara Harris who was consecrated the suffragan Bishop of Massachusetts in the Episcopal Church in America in February 1989. A suffragan bishop serves as an assistant to a diocesan bishop. The Episcopal Church in America was also the first Anglican church to elect a woman, Katharine Jefferts Schori, as its presiding bishop (or primate) in 2006. The Anglican Church in Aotearoa, New Zealand and Polynesia was the first province to elect a woman as a diocesan bishop, when Penny Jamieson was chosen as Bishop of Dunedin in 1989. The Anglican Church of Canada has had women bishops since 1994 and the Anglican Church of Australia since 2008. Two African provinces have elected women as bishops, in Southern Africa and South Sudan; The Church of South India elected Eggoni Pushpa Lalitha as Bishop of Nandyal in 2013. The only woman bishop on the South American continent is Marinez Santos Bassotto, elected Bishop of the Amazon in 2018. In 2013 Pat Storey became the first woman bishop in the Church of Ireland which covers both Northern Ireland and the Republic of Ireland. The Scottish Episcopal Church agreed in 2003 that women could become bishops in but it was 15 years before Anne Dyer was consecrated Bishop of Aberdeen and Orkney. 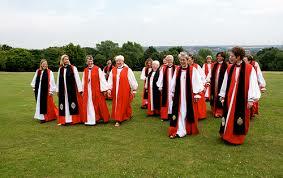 The governing body of the Church in Wales passed a bill providing for women bishops in 2013. It welcomed its first female bishop in 2017 when Joanna Penberthy became Bishop of St David’s. After several years of deliberations, the Church of England’s general synod approved legislation allowing women to become bishops in November 2014. Within a month it had announced the appointment of Libby Lane as Bishop of Stockport in the diocese of Chester and she took office early in 2015. Since then nearly half of all those appointed bishops have been women. The first woman to be become a diocesan bishop in the Church of England was Rachel Treweek, Bishop of Gloucester. Sarah Mullaley, the Bishop of London, is the Church’s most senior woman bishop. Twenty-six diocesan bishops in the C of E sit as “lords spiritual” in the House of Lords. The five sees (or dioceses) of Canterbury, York, London, Durham and Winchester are always represented. The remaining 21 bishops in the Lords used to be appointed on the basis of seniority, but legislation passed in March 2015 stipulated that all vacancies arising within the next 10 years would be filled by women if any were eligible. The first woman bishop to take her seat was Rachel Treweek. There are now four women bishops sitting in the Lords. Libby Lane will become eligible to join them when a vacancy arises, when she is installed as Bishop of Derby in the spring of 2019. The length of time taken to open the episcopate to women in the Church of England was down to its commitment to make provision for those who were unable to accept the development. Those who felt they could not accept the authority and ministry of a female bishop are instead looked after by a provincial episcopal visitor or “flying bishop” who shares their theological position. Some Christians believe that allowing women to be bishops goes against their interpretation of biblical teaching about male headship — ie, that men should have ultimate responsibility and authority in the Church. Others believe that ordaining women as priests or bishops threatens the unity of the “one holy catholic and apostolic church” spoken of in the Nicene Creed. They argue that individual Anglican churches are not free to alter unilaterally the practice of the Universal Church. The Global Anglican Future conference is a conservative reform movement that includes many Christian leaders from within the Anglican Communion, notably several leaders of African provinces. It was founded in 2008 to resist what it sees as doctrinal errors and moral compromise in the communion, particularly over the issue of homosexuality. They do not take a single stance on women’s ordination, but in 2018 the movement agreed not to endorse the principle of women bishops until its members could reach a consensus on the issue. Bishops in the Anglican Communion gather every 10 years for the Lambeth Conference, a time when disagreements between them are often laid bare — most recently and particularly over the issue of homosexuality. The first Lambeth Conference to include women bishops was in 1998. The next conference will be held in 2020 under the chairmanship of Justin Welby, the Archbishop of Canterbury.